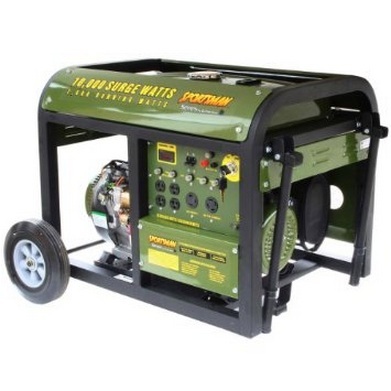 This propane powered Sportsman Gen10K generator is EPA approved and is ideal for leisure activities such as camping or tailgating and for power outages at home. It is able to run welding equipment and household appliances as well. This generator comes with a 15 hp 4 stroke OHV engine. This product costs about $1,100 on Amazon. It comes with never go flat wheels and a wheel kit. The two wheels help maneuver the generator to various places. A manufacturer warranty is included. The main feature is the ability to run 10,000 watts maximum and 7,000 watts. An additional feature is the automatic low oil shut off to protect the engine. Other features include the ability to run for eight hours at 50 percent load and the electric start to save time. It comes with a fuel capacity of eight gallons of unleaded gas. It comes with a 120/240 volt twist lock outlet and four 120 volt outlets. Its noise level is 77 decibels. It also has a durable heavy duty frame to protect the interior of the machine. This product is recommended for its easy portability and usage, and the long term storage convenience of propane fuel.